Building on the BEng, the additional year in this four-year MEng programme allows you to explore a broader spectrum of biomedical engineering and medical physics topics, and to further develop your transferable skills through project work. It prepares graduates to work in a wide range of technology areas from imaging and diagnosis to monitoring and treatment. Grade A in Mathematics and Physics required. A score of 18 points overall in three higher level subjects, including grade 6 in Mathematics and Physics, with no score lower than 5. A score of 17 points overall in three higher level subjects, including grade 6 in Mathematics and Physics, with no score lower than 5. D3,D3,D3 in three Cambridge Pre-U Principal Subjects. Mathematics and Physics required. A,A,A at Advanced Highers (or A,A at Advanced Higher and A,A,A at Higher) Mathematics and Physics at Advanced Higher required. Academic lectures are supported by practical problem-solving tasks which develop understanding of teamwork, the design process and communication. We have close links to several major teaching hospitals and our staff work side-by-side with doctors and health professionals. Their expert knowledge will directly benefit your lectures and teaching sessions. Most biomedical engineering classes are small (fewer than 35 students) providing you with an informal, interactive teaching environment in which you can easily raise questions. Our department scored highly (89%) for overall satisfaction in the 2016 National Student Survey. The programme is highly interdisciplinary, drawing not only from the highly-rated UCL Medical Physics & Biomedical Engineering, but also from a range of engineering and science subjects across UCL Engineering. The BEng in Engineering (Biomedical) has been accredited by the Institution of Engineering and Technology (IET) and partially satisfies the educational requirements for CEng registration. In 2018, we will seek similar accreditation for the MEng in Engineering (Biomedical) which, if granted, will fully satisfy the educational requirements for CEng registration. We offer the option of studying a three-year Engineering (Biomedical) BEng or a more in-depth four-year Engineering (Biomedical) MEng programme. The first two years of study for both programmes are identical and transfer between the two is possible up to the end of the second year. We advise applying for the MEng initially which makes it easier to defer your decision. In your first year, you will receive an introduction to biomedical engineering, including electronics and mechanics, with mathematical modelling and analysis, which are needed to design and develop complex medical technologies. In year two, you will build upon the skills and knowledge you have already gained and take modules in areas of biomedical engineering such as anatomy and physiology, physics and biomechanics. You will also select an optional minor from a range offered across UCL Engineering, including programming, entrepreneurship or a foreign language. In your third year you will study further modules from biomedical engineering and from your optional minor stream, and undertake a major project linked to research strengths across UCL Engineering and UCL’s substantial healthcare partners. The fourth year comprises an advanced-level project, and you will be able to choose from a wide range of advanced-level modules across UCL Engineering and relevant modules from Medicine. 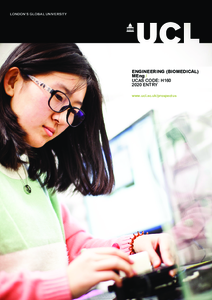 This degree is part of the Integrated Engineering Programme (IEP), a teaching framework that engages students in specialist and interdisciplinary activities designed to create well-rounded graduates with a strong grasp of the fundamentals of their discipline and a broad understanding of the complexity and context of engineering problems. Students register for a core discipline, but also engage in activities that span departments so the development of fundamental technical knowledge takes place alongside specialist and interdisciplinary research-based projects and professional skills. This creates degrees encouraging professional development, with an emphasis on design and challenging students to apply knowledge to complex problems. All first year modules are compulsory. As well as attending lectures, you will also undertake tutorials and practical work, including projects. Projects are conducted in active, well-equipped research groups, often involving collaborations with local hospitals. Many biomedical engineering lectures and projects are taken by a mix of biomedical engineering, medical physics and medical students, reflecting the multidisciplinary nature of the work. Modules are normally assessed by a combination of coursework and end-of-year examination. Detailed course descriptions are available on the department website: Engineering (Biomedical) MEng. Engineers tend to be logical, numerate problem solvers and there is a demand for people who have developed such skills in a wide range of careers. Your application will be especially interesting to us if you can demonstrate your interest in the medical applications of physics and engineering. You should be motivated by a desire to apply your training to the pursuit of improvements in the diagnosis and treatment of disease. Relevant work experience, project work and your knowledge of issues and current affairs surrounding this field will assist your application. Shortlisted candidates will be invited to tour UCL and the departments in which your teaching will take place. During your visit you will be able to view our facilities and meet staff and current students.